Looking for the best chocolates in Vancouver? You’ve found them. Thomas Haas also serves incredible sandwiches. There’s delicious…and then there’s delicious. If you’ve stepped foot into one of Thomas Haas’ two cafes, you know that he consistently falls into the latter of these two entirely different categories. When faced with a challenge, Vancouver’s chocolate king lacks no gumption. Haas is a part of this year’s 2nd Annual Hot Chocolate Festival (January 14 – February 14) and he’s stepped up to the plate, as usual, with an offering so ridiculously mouthwatering, it commands the spotlight: hot chocolate with whipped cream, caramel, a sprinkling of fleur de sel, and hot-out-of-the-oven Sparkle Cookies. The good news for lunch-goers: Thomas’ heartwarming treat is a perfect pairing with one of his decadent sandwiches. 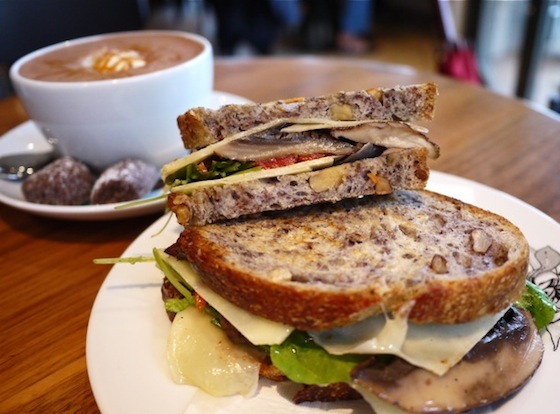 How about a Portobello Mushroom on incredible, olive oil-drizzled organic walnut bread, riddled with chunks of nuts? Plenty of Gruyère, roasted red peppers and a handful of merlot-marinated portobello mushrooms ( bearing the consistency of a buttery burrata) are its exquisite fillings. Head to cityfood.com for full festival details.